with this "Invitation to Create" Contact Paper Cuffs. This activity is also great for encouraging creativity, problem solving and fine motor skills. You can make them as wide as you would like your cuffs (or bracelets) to be. and then peel back half of the remaining length of backing paper with the sticky side up. I loved how while she cut and stuck down she created small areas that she had to figure out how to fill. We talked about how the paper should all be on the contact paper and not hanging over the edge so that we can seal the whole thing when we fold the other half of the contact over. There were many times she estimated the size of the gap and found she had to cut again and again to get the correct size. Providing paper with pictures or patterns on it can encourage children to try and cut then out requiring extra coordination and concentration. 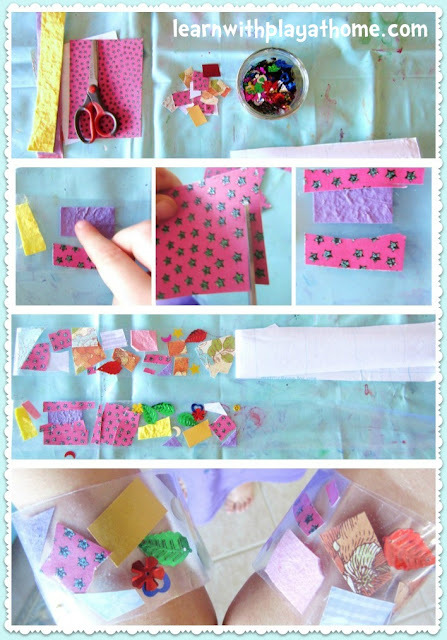 When they are done with their design, peel back the remaining paper and fold over to cover the collage. These have ended up in our dress ups and whenever they come out, our youngest (16 months) loves looking and playing with them. - Simplify this activity for children not at cutting age by providing small pieces of pre-cut paper for them to stick on the contact paper. Talk about the different colours and patterns. - Extend this activity by providing sight words or numbers etc to cut and use within their design. You can also involve the child in measuring the length that they need to go around their wrist twice and assist them in cutting the contact paper strips themselves. - Mix it up by providing different themed papers to cut. Children could design their own logos to make Super Hero cuffs. - If your child is having difficulty keeping the paper from going over the edges of the contact paper, that's fine. You can always trim it off at the end if you like. - We also made some great Number Cuffs to promote number learning (and for fun!). Watch out for that on the blog. Cute! I really need to stock up on contact paper again.